SYNERGY 2.2 is the SECOND of THREE Immersion Courses (FLOW 1.1 and PRESENCE 3.3) to complete the BLB Facilitator Training Program. In this second training BLB SYNERGY 2.2 Course, participants will somatically build upon the basic foundational keys that were skillfully anchored in the Flow 1.1 Course. 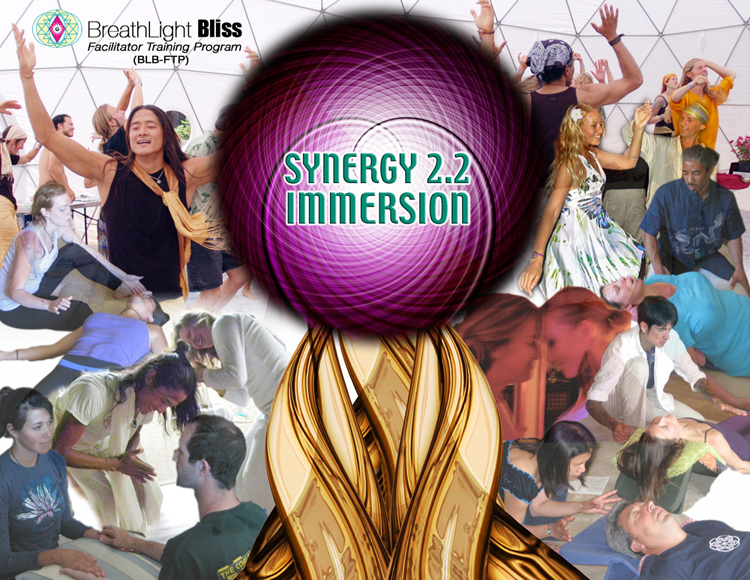 SYNERGY 2.2 is a nine day immersion into assimilating multiple one on one BLB scenarios and completing with a group led experience by each participant. It is the vital completion of the accupressure practicum of whole body mapping & a detailed comprehension of psycho-spiritual/emotional & neural/ sensual body circulation. Empowered Group facilitation, somatic body awareness & heart field cohesion will be a major theme in Synergy 2.2 as individuals will move from holding space not just for individuals but for the entire pod consciousness. 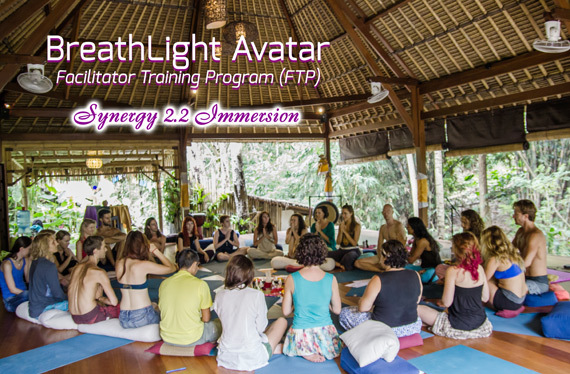 Participants will also learn & apply: DivineJoy Philosophy, Somatic Body Movement, Auracle Colour Therapy & the full embodiment of the experiental ‘hands on’ practical approach to confidently & consistently facilitate others in a life-transforming BreathLIGHT Bliss process. 3. Daily Asana, Tai-Chi, Ecstatic Dance & Pranayama Morning Practices to prepare the Training Immersion Day. 5. Introduction of various & alternative somatic-tantric-spinal alignment breath practices to enhance personal & group cohesion & skillful facilitation. 6. Each Participant facilitating at least ONE group session with Instructor supervision and group feedback. All-Inclusive Package Includes: Certification Training Manual, All Seminars, 14 Nights Private (shared bath) Luxury Accommodation, Morning Vinyasa Flow Yoga, Optimal Green Juice Liquids & Radiant Living Food Meal plan, Dolphin Boat Excursion, Ancient Temple Ceremonies, Epic Waterfall Hikes, Nurturing Spa/Massage package and more! BREATHLIGHT AVATAR in BALI Details, Click HERE or on Banner Below! Please Contact US at info@divinejoy.org or 808-639-LIVE (US) or in Bali at (062) 82144092677. Mikael and his Support Team is also available to co-create, share, & teach Private or Public Immersion Training Retreats with Hosts and/or other Co-creative Teachers worldwide and/or private groups visiting Kaua’i.